Mascot fail: Truman the Tiger drops, shatters the 2011 Independence Bowl trophy. 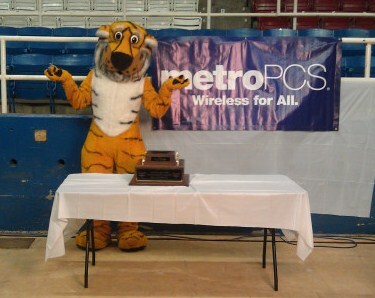 Truman the Tiger posing with the shattered AdvoCare V100 Independence Bowl trophy. Dec. 27, 2011: Yesterday evening the University of Missouri defeated North Carolina 41-24 in the 2011 AdvoCare V100 Independence Bowl. But the only thing people will remember about the sparsely attended game is that UM’s mascot, Truman the Tiger, accidentally dropped the trophy while attempting to lift it over his head for a pregame photo opportunity. The crystal bowl on top of the prize (which is reserved for the winner of the game) shattered on the concrete floor. Asked by a reporter if he was responsible for breaking the trophy, Truman nodded. Then he threw his paws in the air, and covered his eyes to mimic sobbing, indicating that “he was as sorry as a college student in a Tiger suit could possibly be,” wrote Harry Plumer in The Missourian. A local jeweler later provided a replacement for the shattered crystal bowl. Back to School Begins with Bathrooms—School restrooms are “The most critical, yet overlooked aspect in the annual trek back to school,” says guest columnist Tom Keating, founder of Project CLEAN. Liberace Museum in Las Vegas to close—On October 17, the Liberace Museum in Las Vegas will be history, a victim of the ongoing recession and Liberace’s dwindling fan base. The End of the Line—Imagine a world without fish. Fox News: We report. 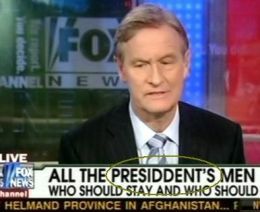 You ddecide—Fox News: We report. You ddecide.